Optical light may be collected and focused by means of a transmitting lens that refracts the rays as shown in Figs. 1a and 2a. The disadvantage of a lens in astronomy is that the light must traverse the glass which can lead to imperfect focusing due for example to color dependence of the index of refraction (chromatic aberration). Also, the lenses become very heavy as they become larger. This makes difficult the precision positioning and support of the lens in a movable telescope structure as is required for a good focus. In contrast, a relatively lightweight mirror may be used to reflect the light to a focus (Fig. 2b). In this case it is only the shape of the mirror that must be precisely machined and maintained. All current major optical telescopes use reflective optics. A primary mirror concentrates the light at a primary focus (Fig. 2b). For the very largest telescopes, instruments can be mounted at the primary focus and an astronomer can ride around in a little cage which surrounds the focus. This allows her to change photographic plates, all the time listening to classical music, seemingly suspended among the stars. We say "ride" because the telescope will point to many different positions in the sky on a typical night of observing. Unfortunately, modern electronic detectors generally make such rides unnecessary now. Most radio telescopes operate in the prime-focus configuration. They often feature a large metallic antenna dish that reflects the radiation to a detector at the prime focus. Alternatively, a secondary mirror can direct the light through a hole in the large primary mirror to the Cassegrainfocus (Fig. 2c). The secondary mirror blocks some of the light entering the telescope, but only a small fraction of it. The Cassegrain focus is convenient because large, heavy instruments can be mounted more easily on the back end of the telescope. The secondary mirror can be changed to modify the effective focal length in many telescopes. One practice is for the secondary-mirror structure to contain two mirrors (Fig. 2c). Rotation of the secondary mirror structure by 180° moves the alternate mirror into the beam. The light from the primary mirror can be intercepted by a flat mirror which directs the light toward the side of the telescope to the Newtonian focus which can be examined with an eyepiece mounted on the side of the telescope (Fig. 2d). 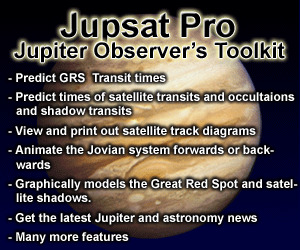 This scheme is often used for amateur telescopes. In large telescopes, the light can be directed by a series of mirrors to a temperature-controlled room below the telescope to the Coudé focus (not shown). There a large spectroscope disperses the light into its spectral colors with high resolution (large X/AX). Figure 5.2. Focusing systems. (a) Refracting lens. 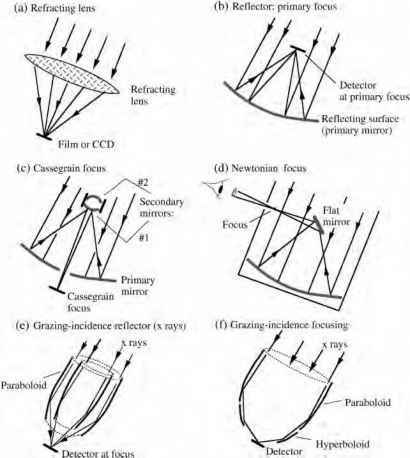 (b,c,d) Reflecting telescope with primary focus, Cassegrain focus, and Newtonian focus, respectively. The choice of two secondary mirrors in a given telescope allows the telescope to operate with two different focal lengths. (e,f) Grazing incidence x-ray telescopes with one reflection and two reflections. Additional collecting area can be obtained by nesting the mirrors as shown in (e). The foci shown here are unrealistically close to the collectors. are often mounted in the altitude-azimuth configuration where one axis or rotation is horizontal and the other vertical. This simplifies the mechanical design and makes it easier to keep the primary mirror in its optimal shape. It is easily distorted by thermal gradients and the varying forces of gravity as the telescope moves to new orientations. The newest optical telescopes have sophisticated systems for monitoring and adjusting the shape of the primary mirror so that it can be kept in its optimal shape throughout a night of observing. 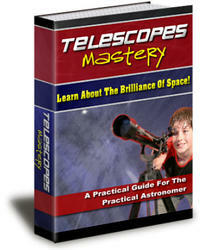 Telescope designs also pay great attention to keeping thermal gradients and convection to a minimum. Unknown to astronomers for a century was the fact that thermal currents within the telescope building were a major source of poor image quality. This arose from solar heating of concrete structures that are slow to cool and to power dissipation in the building (heated offices, etc.) The Magellan/Baade telescope in Chile is obtaining images as good as 0.30'' (full-width at half maximum intensity) with good thermal and mirror-shape control. The grazing incidence arrangement for x-ray astronomy (E < 10 keV) is shown in Fig. 2e. The x-rays reflect off a very shiny surface that looks like the inside of a cylinder but in reality has a parabolic shape in cross section, a paraboloid. This form will focus perfectly a point source at great distance that is on the axis of the paraboloid, but will not focus well objects that are off the axis. In the most elegant systems, the x rays reflect twice from the inner surface, first from a parabolic surface and then from a hyperbolic surface (Fig. 2f). This provides good off-axis focusing. The grazing geometry yields a relatively small collecting area since the photons must strike the inclined surface of the mirror. To improve the collecting area, a number of mirrors can be nested within one another; a second such mirror is shown in Fig. 2e. Some x-ray systems emphasize large collecting area rather than high angular resolution. They have conical mirrors that approximate the parabolic shape and have dozens of such mirrors nested about a common axis. Electromagnetic radiation with photon energies above —10 keV (e.g., high-energy x rays and gamma rays) can not be focused with currently known techniques. Thus alternative non-focusing methods of constructing images are used. Although generally non-focusing systems are much less sensitive to faint sources, they are sometimes preferred even when focusing is available. For example, in the 1-10 keV band, the study of time variability of bright sources requires large collecting areas which are difficult to attain with x-ray focusing systems. The Rossi X-ray Timing Explorer (RXTE, launched 1995) uses such techniques to study black hole and neutron star systems. Tubular and modulation collimators Mechanical collimators may be used to restrict the regions of the sky that their detectors can "see". One type is simply a set of stacked tubes, like handfuls of soda straws (Fig. 3a). Since the radiation from a particular point on the sky impinges on the entire detector, the signal from the star must contend with background from the entire detector. The range of angles A9 from which photons can reach a point on the detector through a tubular collimator is shown in Fig. 3a (inset); A9 ~ d/ h.
Figure 5.3. Non-focusing collimation. (a) Mechanical tubular collimation ("soda straws") and an expanded view of one of the tubes showing the angular extent of the field of view. (b) Operation of a multi-pinhole camera. The location of the shifted image of the mask pattern reveals the arrival direction of the photons. This opening angle is comparable to the angular resolution. The angular resolution attainable with tubular collimators is typically ~1°. The detector used with such collimators is likely to be a proportional counter or a crystal scintillator (Sections 6.2 and 6.4). Tubular collimators make possible x-ray or gamma-ray systems with larger apertures than focusing telescopes, albeit at the expense of angular resolution. Timing studies of bright x-ray sources are made possible by the large aperture because large numbers of detected photons are needed to provide the required statistical precision in short time intervals. 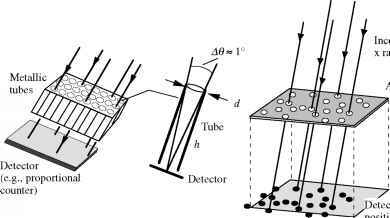 The detectors need not be position sensitive; the detector output does not distinguish where on the detector the photon landed. It is the mechanical collimator that defines the arrival direction of the incoming rays. Multiple pinhole collimator If one uses a detector that locates the position at which a photon strikes its surface, such as a piece of film, or a CCD detector (Section 6.3), other arrangements become possible. For example, a mask with randomly placed "pinholes" may be placed above the detector. A point source will then project a pattern of pinhole images onto the detector (Fig. 3b). The sideward displacement of the pattern on the detector surface directly indicates the direction from which the photons arrived, i.e., the location of the source on the sky. This is an extension of the simple pinhole camera from one to many pinholes. The multiple pinholes provide more effective area, but they introduce more interference between the patterns if there are two or more sources in the field of view (FOV). A typical system would have a large FOV, say 30°. The angular resolution is much less, say 10', because it derives from the (small) pinhole diameter and the (large) distance between the mask and detector. If one had chosen the response function for the position a, 8 where a source really exists, and if that source were the only one in the field of view, the two functions R and Rp would be identical at all points x, y, except for statistical fluctuations in the real data. When one is positive, the other would also be positive, and similarly for the negative excursions. Thus, at all points, their product would be positive, and the sum (integral) of the product over the detector plane would then yield a large positive number. If on the other hand, there is no source at the chosen position, the two functions (trial and real) will differ more or less randomly with respect to one another. The products will be both randomly positive and negative, and the result of the integration will be approximately zero. Calculation of C(a,8) for all trial positions (a,8) in the field of view would thus yield only one position (resolution element) with a high value. All other positions would yield near-zero correlations. A sky map could be constructed with the values of C(a,8). It would show a high spot at the position a,8 of the actual source.